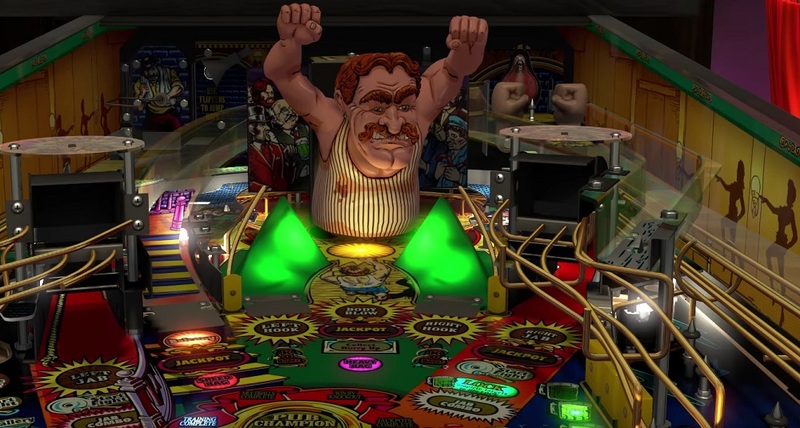 A new trio of classic "real-world" pinball machines have been released for Zen Studios' great pinball platform, Pinball FX 3. Williams Pinball Vol. 3 adds three famous titles from the silver ball's golden era to the wide variety of titles the Pinball FX catalogue already has to offer. This new volume kicks things off with 1997's Theater of Magic, where players must guide their ball through a series of increasingly difficult stage acts, culminating in an impressive grand finale. This game is well known for its dramatic score and rotating magic chest. It is looked down upon somewhat by pinball fans, but I get a kick out of it. Also included in Volume 3 is 1998's The Champion Pub, which is essentially a game about drinking and bare-knuckle boxing. This title features frantic gameplay, a list of increasingly-difficult opponents, a rowdy dude on the playfield that you have to bash and, most notably, a selection of terribly-performed accents. Rounding out the trio is a slightly rarer title, 1996's Safecracker. This particularly unique machine has you playing against the clock, rather than limiting you to certain amount of balls, as you attempt to break into a high-security vault. The original machine awarded players with plastic tokens as a reward for completion. All three games can be played in standard form of with Pinball FX 3's additional 3D models and effects. Fortunately, Zen has retracted the ridiculous censorship that plagued their first run of Williams' releases, and now these classic recreations feature an option to restore all the original artwork and DMD animations to their barely-risque original form. Pinball FX 3 is available now on PS4, PC, Xbox One and Nintendo Switch.